Today, since I only worked for two hours, I've decided to give myself a much needed manicure. After moving to Tokyo, I've had to learn how to do my own nails (and I still have a lot of learning to do!). 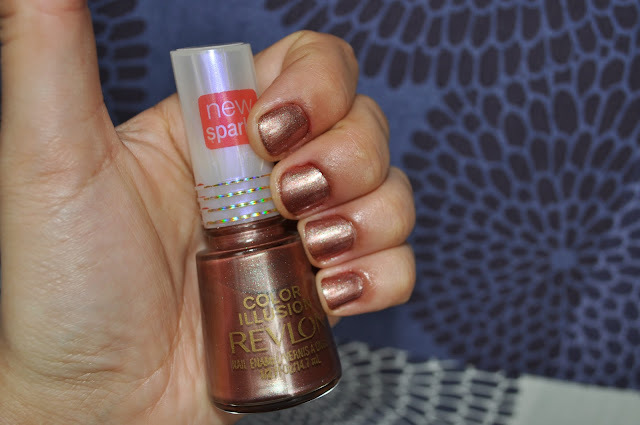 As I was rummaging through my polishes, I came across Revlon's Cocoa Shimmer; I don't know how but I totally forgot about this one. Cocoa shimmer is a pinkish bronze with pink and green sparkles. I wouldn't say this polish is a douchrome per se, but there is this pretty pinkish/reddish sheen to it (wait, doesn't that make it duochrome??? ); odd since the sheen doesn't show in the bottle but appears once appealed to my nails. Unfortunately with day is still cloudy and gray. I tired to capture the pinkish/reddish sheen but the image came out blurry. Well, at least you can see some of the green and pink sparkles in the polish, not a total fail. I'd like to know what some of your favorite polishes for fall. Same here, loving my browns and plums :) the fall weather is slowly creeping in, but still a bit to sunny for my favorite deep fall/winter colors. Also, thanks for the tip technique, Sounds as if the end result would look beautiful. Must try it!! I did a google search for this color and your page came up. Very pretty color, and great blog! Followed ya :) I moved to Tokyo myself back in 2010, but have since been transferred to Osaka. So what brought you to Japan? I've only been to Osaka once but loved it there. Okay enough of my interrogation, please keep in touch! !